When you need a quick snack to fuel up, a fruit smoothie provides a nutrient-rich option. Adding a cup of fresh grapes to the blender gives the smoothie a sweet flavor and helps you meet the U.S. Department of Agriculture’s daily recommendation of 1.5 to 2 cups of fruit each day. Grapes also contain plenty of antioxidants that may keep your cells healthy and can help prevent chronic disease down the road. Skip the sugar bowl and use grapes to flavor your smoothie. Cotton candy grapes have a strong candy-like flavor and can sweeten smoothies made with mild-flavored fruits and vegetables. If you prefer a tart taste, try Interlaken grapes, a seedless variety that has both sweet and tart flavors, according to Oregon State University. Concord grapes and other purple varieties provide anthocyanins, which act as powerful antioxidants. If you puree seeded grapes into your smoothie, you will receive the polyphenols from the seeds. Grape seeds also provide vitamin E, an antioxidant vitamin. Common smoothie ingredients include juice, fresh fruit, milk, yogurt and vegetables. Some smoothie recipes call for ice cubes, but adding too many can dilute the flavor and thickness of the smoothie. Instead of ice, toss a handful of frozen grapes into the blender. 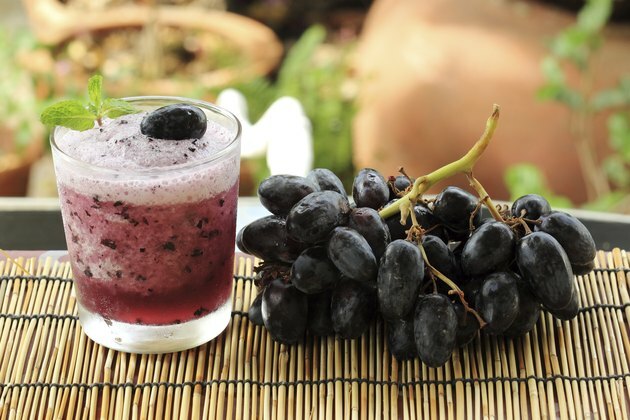 If you want a grape smoothie but do not have fresh grapes, use 100-percent grape juice. According to the Academy of Nutrition and Dietetics, grape juice provides a rich source of antioxidants that may have a protective effect on heart health. If your smoothie recipe includes green leafy vegetables, try adding grape leaves for variety. When making your smoothie, keep food safety in mind to prevent food poisoning. According to the Produce for Better Health Foundation, you can keep grapes in a plastic container in the refrigerator for approximately one week. Store grapes on a higher shelf than raw meat in the refrigerator so the juices from the meat do not drip on them. Wash all fruit before making your smoothie. After blending, immediately refrigerate the leftovers. According to FightBac.org, foodborne bacteria reproduce quickly between temperatures of 40 and 140 degrees Fahrenheit. Room temperature falls in this zone. Academy of Nutrition and Dietetics: Does Grape Juice Have the Same Heart Benefits as Red Wine?